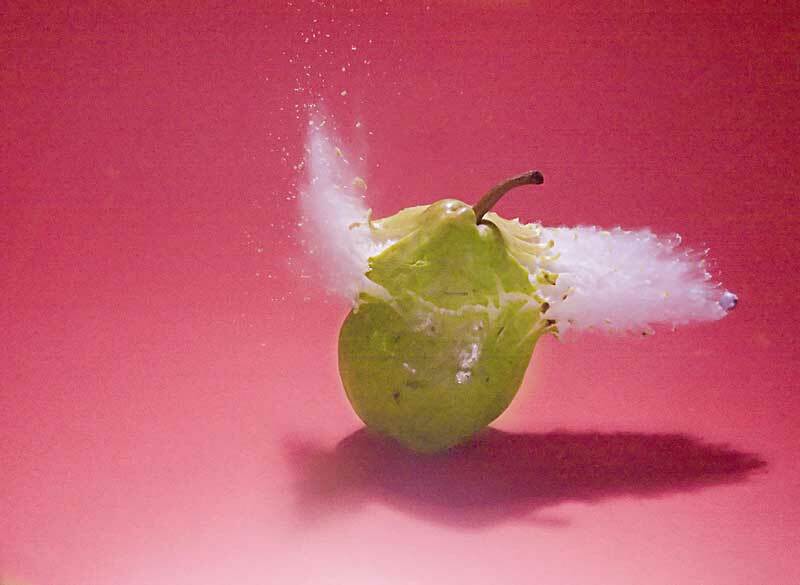 The master of high speed photography was Harold Edgerton, and we are only following in his footsteps. 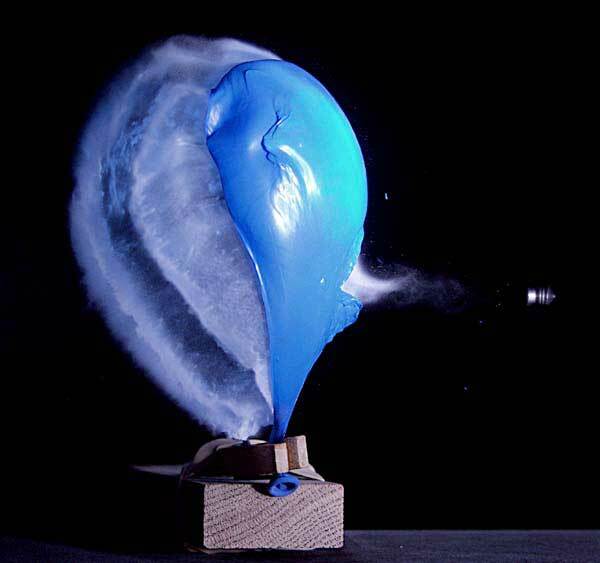 "Doc" Edgerton invented the photographic flash and refined it for ultra high speed photography that allowed him to freeze a bullet in midair. For the hobbyist, bullets are dangerous, probably illegal to shoot in your studio, and too fast. But we can shoot similar scenes with an inexpensive pellet gun and the Time Machine. In a dark room the camera shutter is opened, an optical detector "sees" the pellet leave the gun barrel, and the Time Machine waits a programmed delay before firing the flash to catch the picture. The following pictures show some examples taken with the Time Machine. 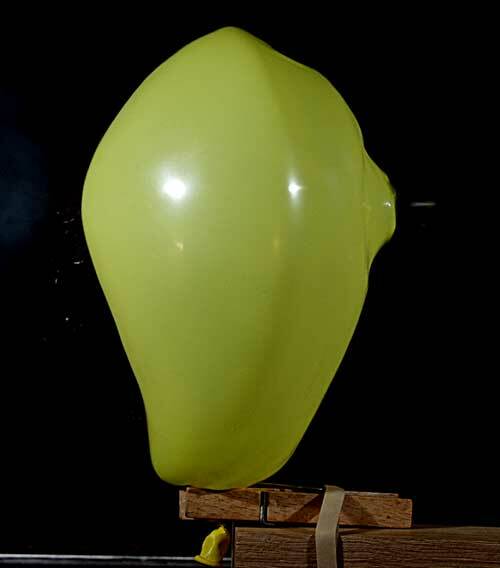 The gun used in the balloon pictures was a Crosman model CRS-2240. It fires 22 calibre pellets at about 470 feet per second. The flash was two Vivitar model 285s that have been modified to shorten the flash duration to about 100 microseconds. We have also used an EG&G Multiflash and an EG&G Microflash with flash durations as short as half a microsecond. The Time Machine allows you to enter delays as small as tens of microseconds. The Time Machine allows you to locate a 22 calibre bullet within a quarter of an inch. All images are copyrighted by Bryan Mumford and may not be used without permission. 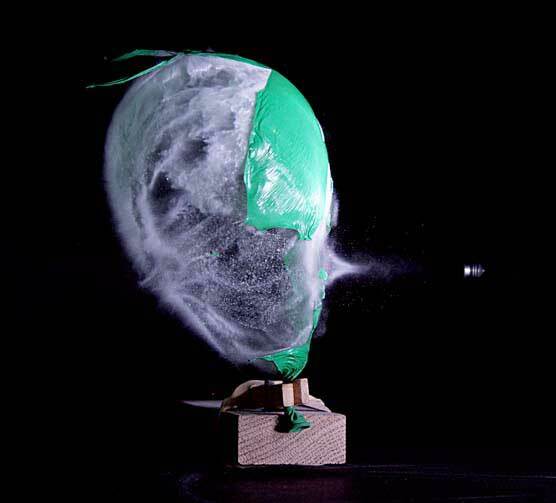 In this picture the pellet can be seen approaching a toy balloon at a speed of 470 feet per second. The pellet will travel .564 inches in 100 microseconds. We cannot freeze it completely with the Vivitar flash, but we can catch it in flight. The blur conveys motion. The next picture was taken with a slightly longer delay. The balloon has been penetrated and popped, but the pellet has not quite made it out the other side. The balloon is a blur ... these small balloons are tight with air and they collapse very quickly. 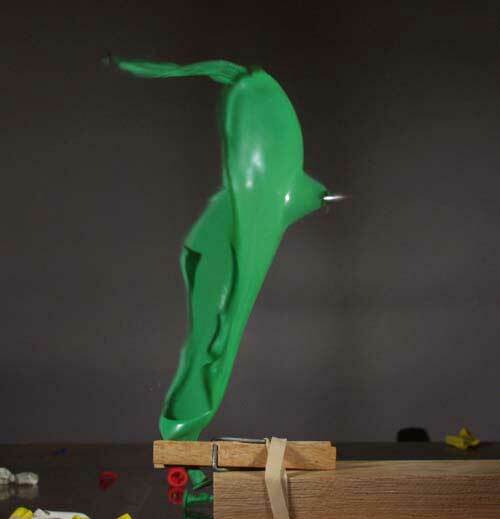 The third picture was taken with a slightly longer delay, after the pellet had punctured the balloon and exited the right side. 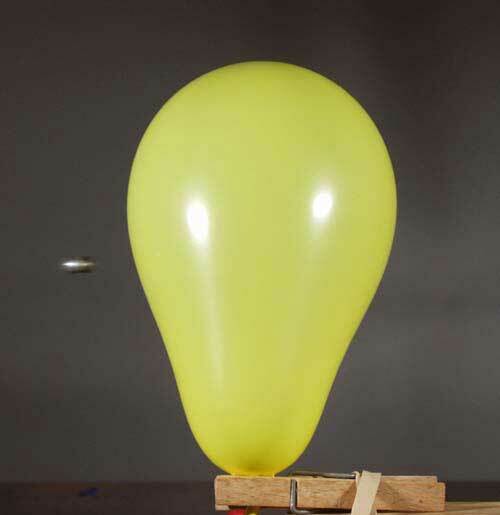 See how the balloon is stretched out by the pellet. The table top is seen to be littered with remants of other shots. 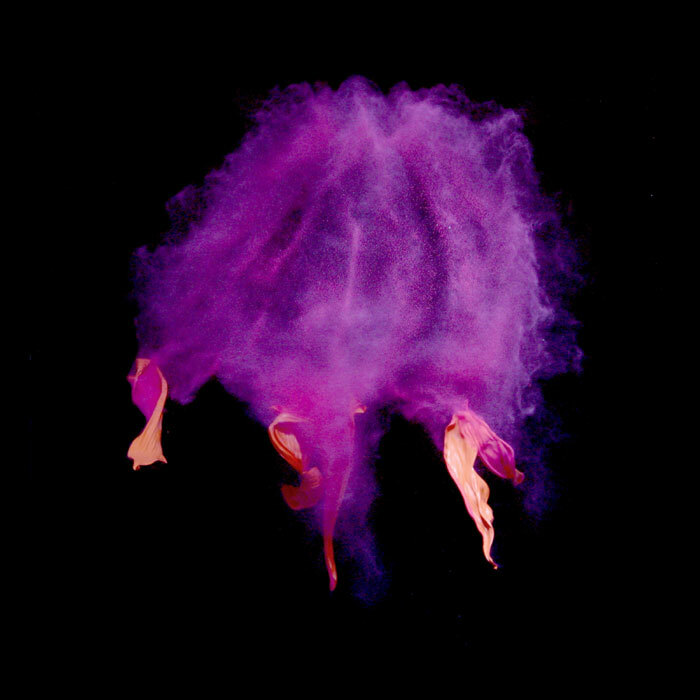 The pellet has pierced the balloon and erupted out the other side. The exit hole (right side) is oscillating as the pellet snaps through. 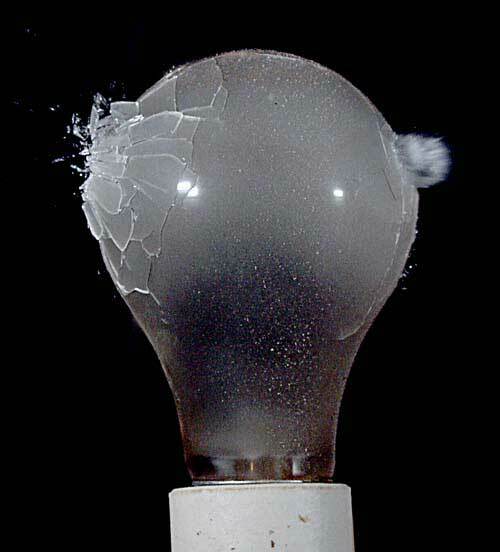 A pellet has entered a light bulb on the left and is just breaking out the right side. One second later there was glass all over the studio and no light bulb. The pellet has entered the egg at the left side but not exited yet. One second later there was raw egg all over the work table and the backdrop. The pellet has entered a water balloon and is trying to break through the rubber on the right side. 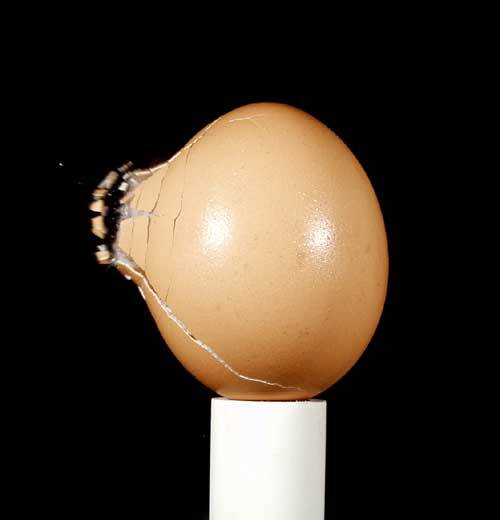 It's a flat headed pellet, and it takes a moment to break through. 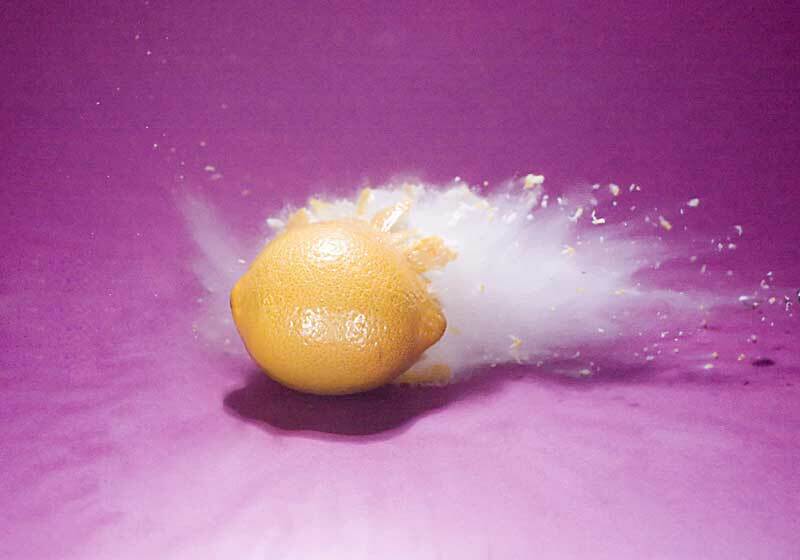 The delay between shooting the pellet and firing the flash was .005 seconds. This water balloon split open in a big smile as the pellet entered. 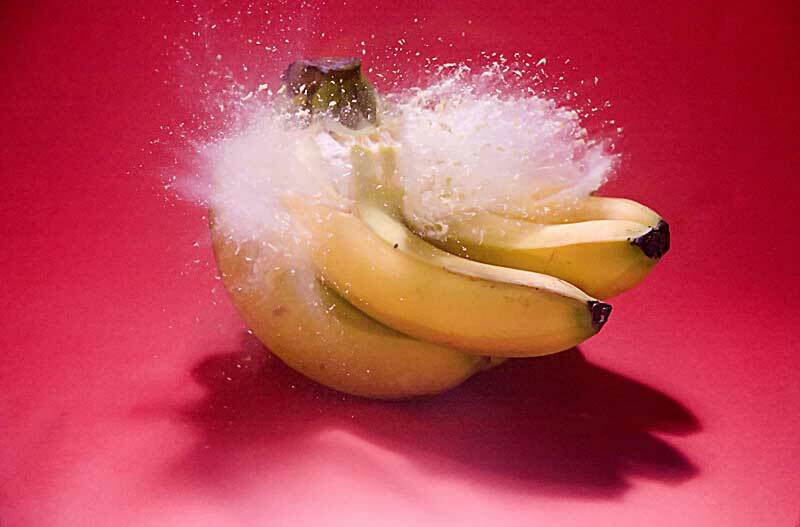 The delay between shooting the pellet and firing the flash was .005 seconds. 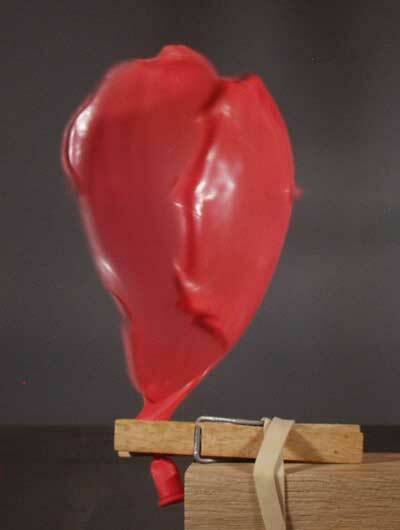 The rubber around this balloon has completely collapsed, leaving a ball of quivering water. 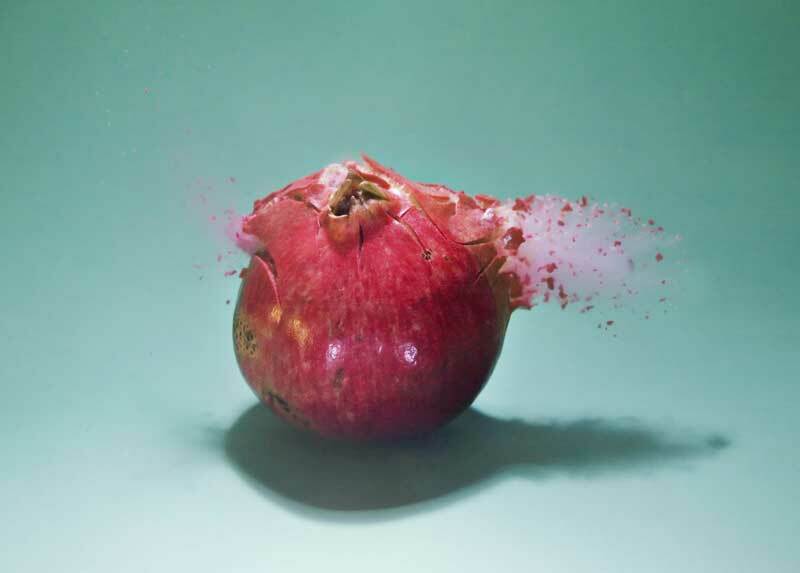 The delay between shooting the pellet and firing the flash was .010 seconds. 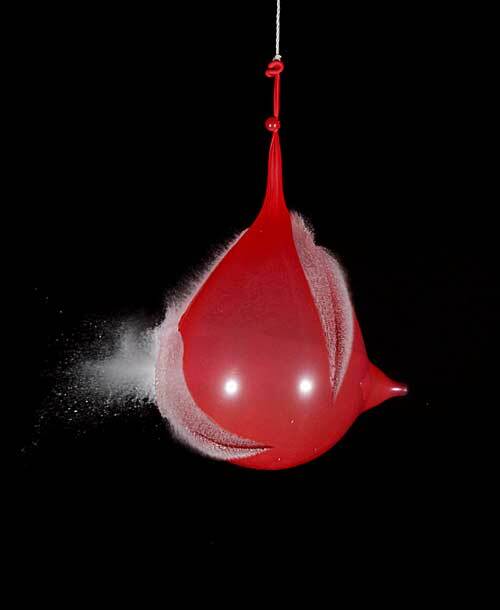 A balloon with a little cornstarch in it is filled with air and then shot with a pellet gun. You can see the pellet coming out of the other side. 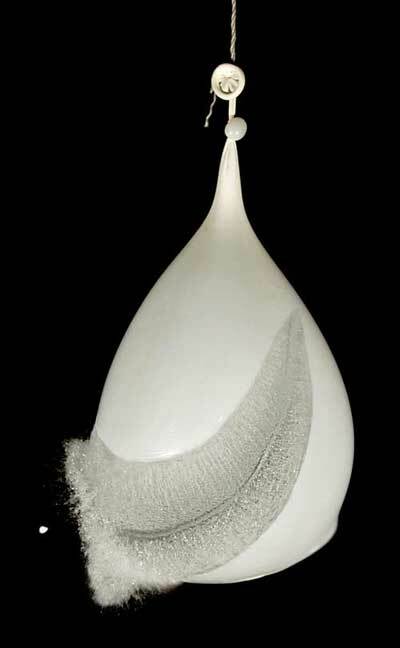 Another balloon with cornstarch. 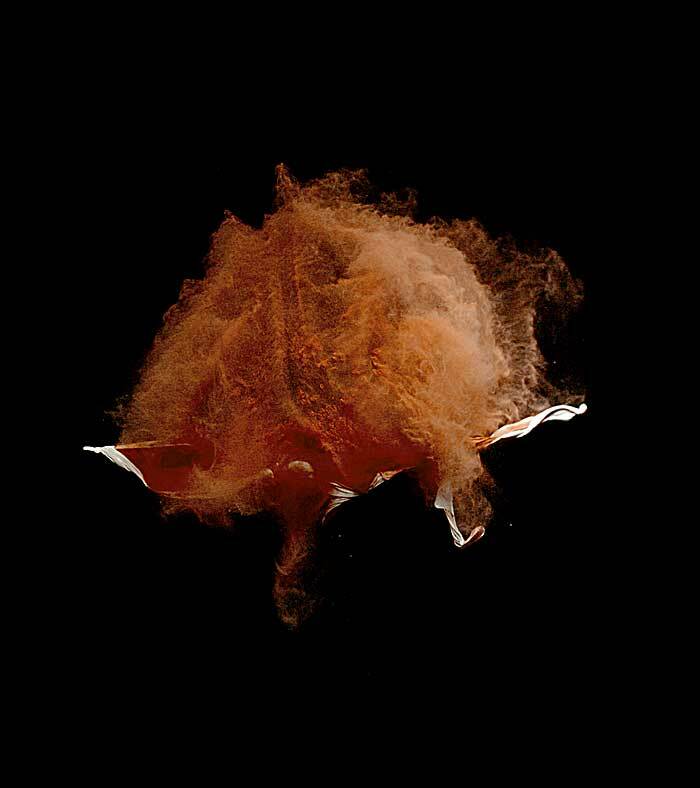 The dust in this one clearly preserves the shape of the balloon before it was popped. 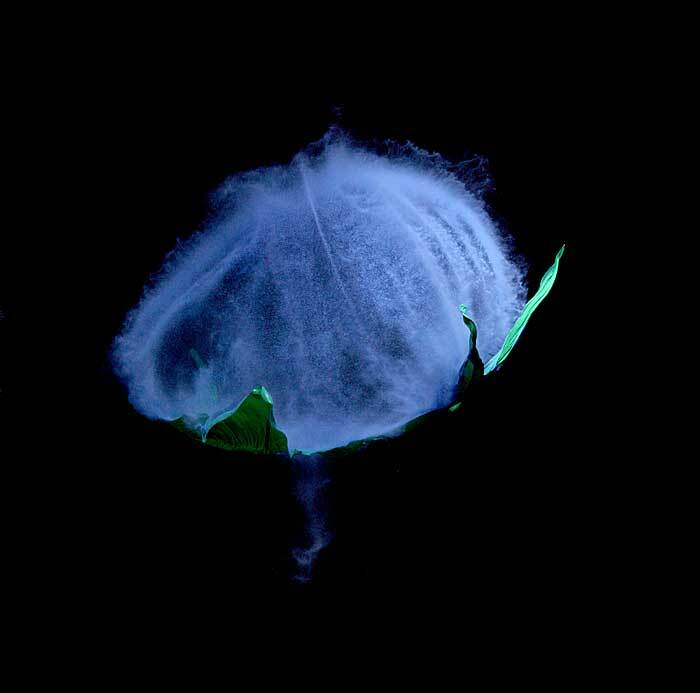 This picture was taken with an EG&G Microflash, which has a flash duration of less than one microsecond. 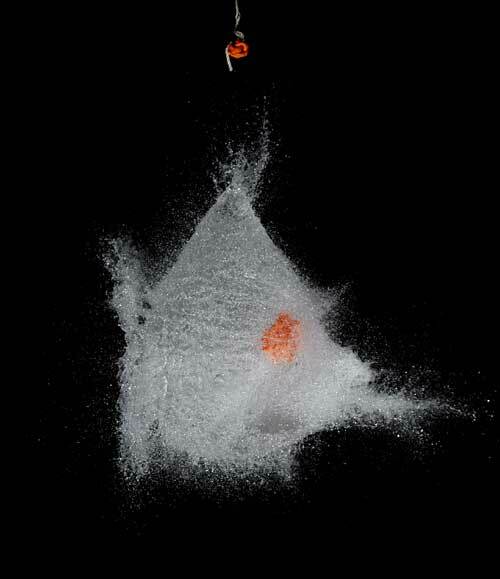 Note that the pellet is frozen in space with no blur. This dust filled balloon evidently ripped up the left side from bottom to top as the pellet tore into it. You can see the crevice in the dust bubble, which still preserves the original shape of the balloon. Also taken with the EG&G Microflash. 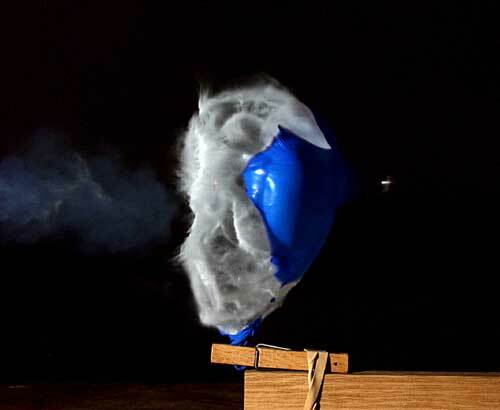 Note how the dust appears blue because the flash illuminates the dust through the blue balloon. These images were exposed with an EG&G Microflash triggered by the Time Machine. The images are copyrighted by Deepa Jain and may not be used without permission.